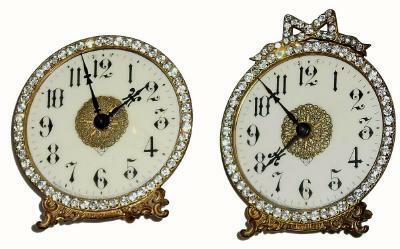 C.1904, Ansonia (Lot of 2), Glass dial novelties: 1) BEACON, see Ly No. 2096 + 2098, in excellent original condition, with all brilliants intact. 2) DIADEM, see Ly No. 2106, also with all brilliants intact. These are a wonderful set. Height 5.75" One bid for both.